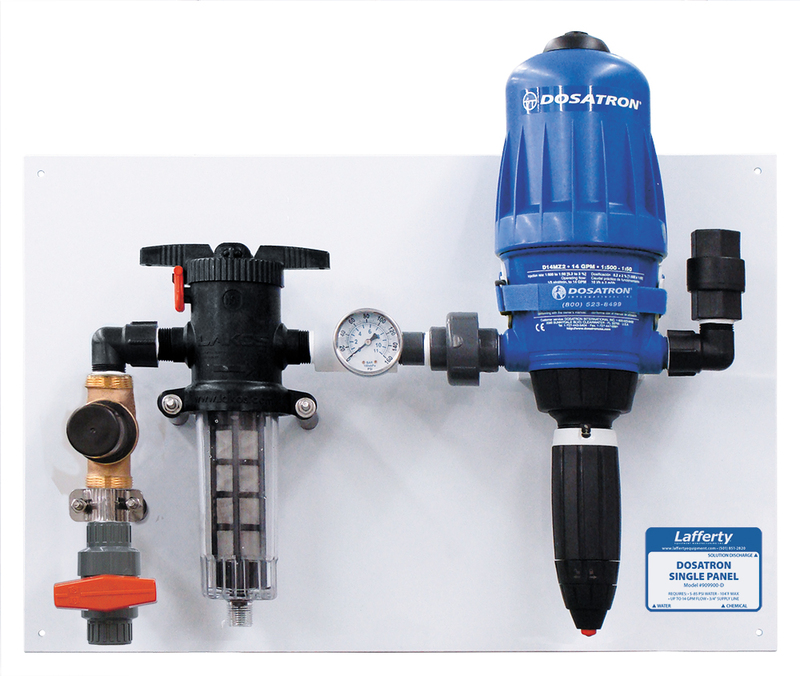 Dosatron Single Panel | Lafferty Equipment Manufacturing, Inc.
Dosatron Injectors are water-driven, non-electrical, proportional dispensing systems that dilute chemical concentrates to required ratios and deliver RTU chemical solution to pump fed applicators. For convenience and ease of installation, the Dosatron Single Panel features a polypropylene mounting plate and includes a water filter, water regulator, flow restrictor, pressure gauge, and a mounting bracket for a Dosatron injector (available separately). Fully adjustable proportioners cover dilution ratios from 1:3000 up to 1:5 and a choice of Viton, Aflas or Kalrez seals are available for chemical compatibility.